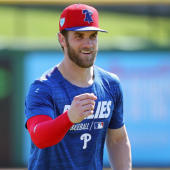 Jones played the field for the first time this spring in an intrasquad game and is expected to make his Cactus League debut Tuesday, Nick Piecoro of the Arizona Republic reports. This was the third consecutive day Jones got at-bats. He'll do some work in the trainers' room Monday when the Diamondbacks are off before facing major-league competition for the first time.